Description : Tapri Glasses – Auto ; This Product Contains 6 designer Hand Painted Glasses along with the Stand and is painted at multiple layers along with protective coating to make it very robust and ready for daily use. Each Glass Measures approx 90 Ml. 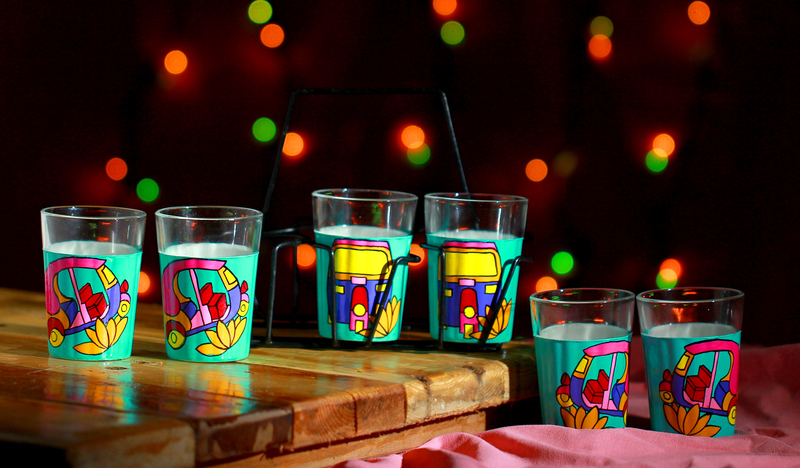 Theme : These glasses depict the various modes of transportation used by masses since years. Description : Product Contains 6 designer Hand Painted Glasses along with the Stand. Product is painted at multiple layers along with protective coating to make it very robust and ready for daily use. Each Glass Measures approx 90 Ml. Tapri Glasses – Big B Theme : These Glasses pay homage to Big B’s most remarkable movies over the years. Description : Product Contains 6 designer Hand Painted Glasses along with the Stand. Each Glass Measures approx 90 Ml.Tapri Glasses Chalti Ka Naam Gaadi Theme: These tapri glasses are the collection of all the different from of transportation used in olden times. Description : Tapri Glasses Nimbu Mirchi , This Product Contains 6 designer Hand Painted Glasses along with the Stand. Each Glass Measures approx 90 Ml. Theme : Nimbu mirchi in Indian culture is believed to ward of evil spirits. These glasses are inspired from this age old belief. Tapri Glasses Zingalala, Theme : Inspired by Warli print. Our Zingalala glasses show variety of images depicting the tribal dance of native indians. These traditional metal products are skillfully melted, moulded and beaten by our craftsmen to create inimitable utensils to give a story to every meal on your dining table. Known for its anti-inflammatory and antiseptic properties from generations. We have great old-fashioned products which are made up of Brass, these are not only versatile but also economical & they will last for generations. The Brass is an alloy which is the combination of copper & Zinc. Check out our range of enduring perpetual masterpieces of age-old products that not only give a hint of vintage-y look but also look exceptionally beautiful! Brass Kettles – Your kitchen can’t be complete without them because hot beverage fans consider a kettle as kitchen essential. These are great value models for effortless performance, the designs are also attractive with the range of colors and styles to suit every type of kitchen decor. These are hand painted kettles with the great elegant look for the kitchen. Brass Tiffin: These brass tiffin looks amazingly beautiful & attractive due to the hand painted design on it. Actually these were in use in the 19th century but due to its heaviness, rare availability & high cost it has been replaced with the other metals such as Aluminum, Steel etc. The taste & delicious touch to the food in the brass carrier cannot be compared with any other metal. Ghoongroo: The Indian classic dancers & belly dancers use Ghoongroos for their ankle. You are rarely to get this product in hand painted galleries. It’s a must for all dancers! Brass table bell: The beautiful brass table bells are very rare & precious objects nowadays. Even your Android phone cannot give you such a facility/ bell to call everyone when you have your dinner ready else have any announcements in the family. You can also use it on your office table & can add a classy look to the ambience. Milk Measure: It’s beautifully hand painted measure which would be the prefect display in the kitchen & also for measuring ingredients out. 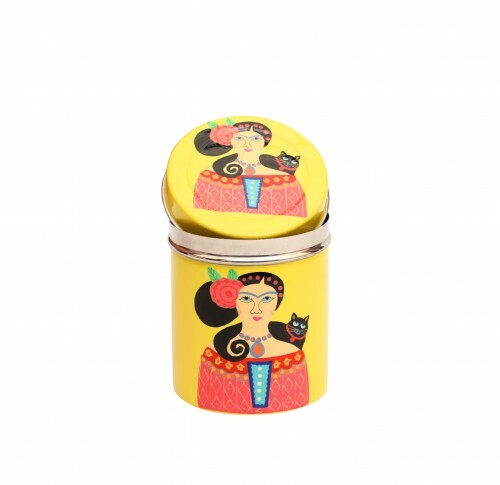 Pan Daan: It’s a traditional & antique Pan Daan which has a beautiful hand painted parrot on it. Nowadays, the Brass objects are very trending. The range of products which we have in the category under Óld is Gold will really give a very traditional classy look to your house or kitchen ambiance. Give you home a Royal look!